The heart of our homes is generally where we gather for meals, and in my home (as I’ve mentioned before) it’s open plan with no formal dining room and just the dining area as you see it here. Since our home was built in 1962 I have always found that to be sort of forward thinking, or maybe it’s because Florida life tends to be casual and lots of it is centered around the pool. I love to have a lot of options to change the look of this room and fabric is one of the easiest for anyone, even if you don’t sew! Which brings me to dining chairs. 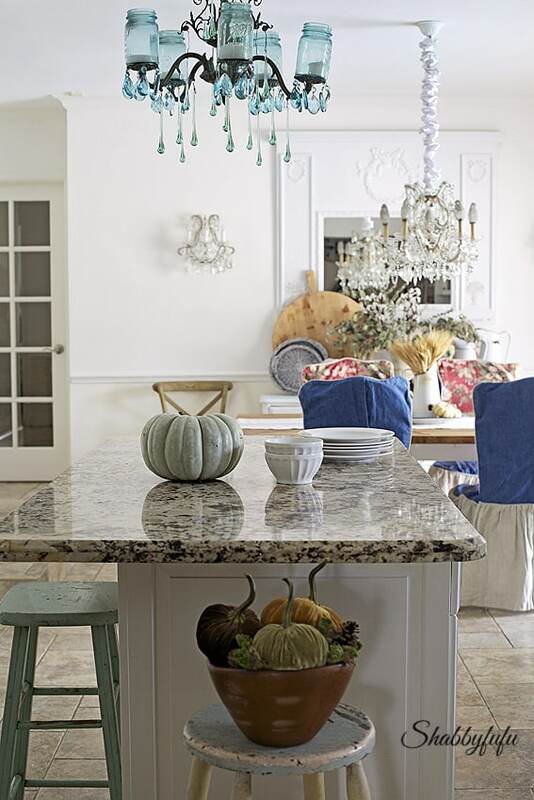 You might not notice right away in this pull back shot taken behind the kitchen island, but take a good look and see that the chairs are different. 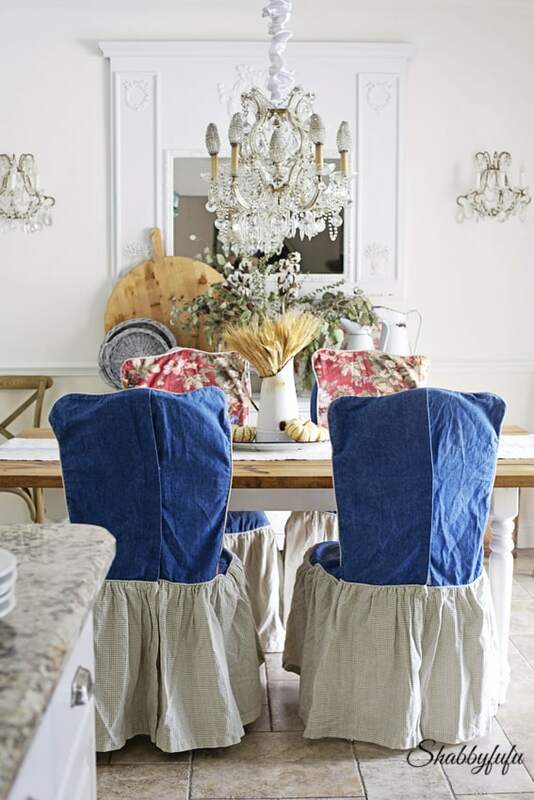 After all of these years I still really love these and call them my Ralph Lauren~esque French country chair slips! Oh you know…blue jeans, rich florals and on the bottom skirts the fabric is a pale celadon green mini~check. Chair slipcovers are such a great way to change the look of a room, and you don’t have to have lots of extra chairs around to store! It’s fun to change things up and add pops of color with fabrics. If you do sew that’s a bonus and I have made chair slipcovers, which is really not that difficult to do if you craft a paper pattern first. 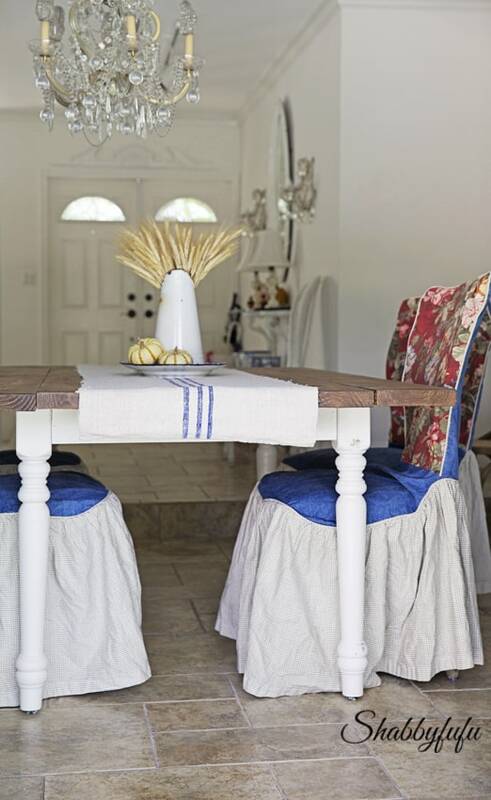 The slips above were a fun project for a couple of clients who wanted some colorful ruffly slipcovers after purchasing the white chair covers that we used to sell in the shop. 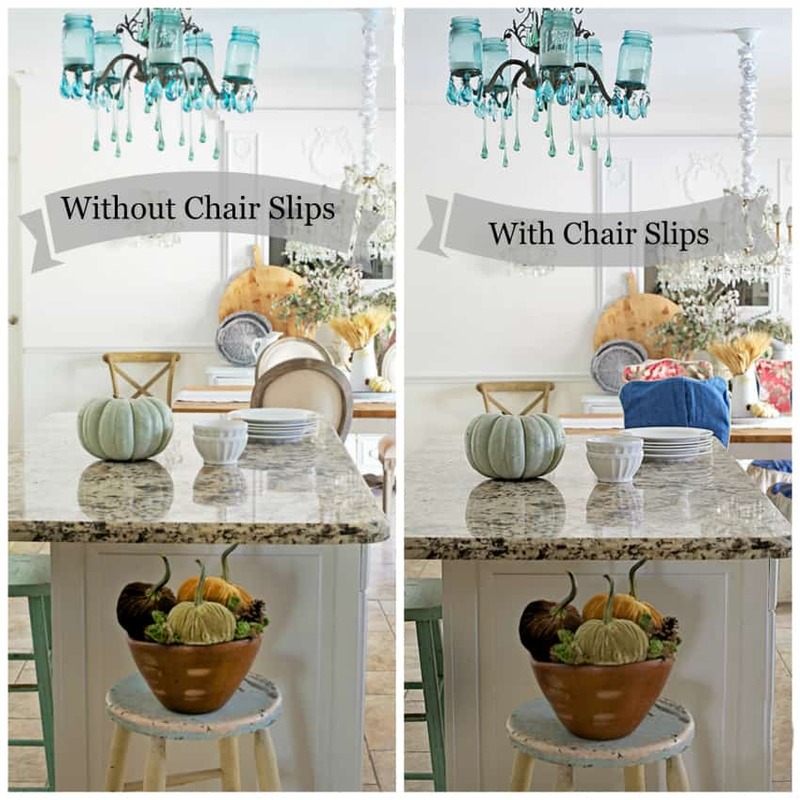 Same chairs, same dining area…but it looks so different with colorful fabric over the chairs. 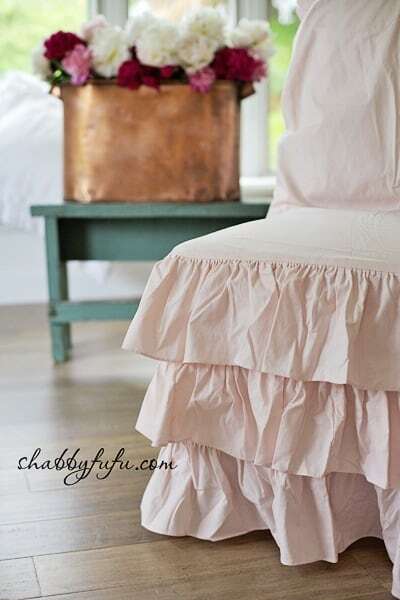 love your wonderful chair slips, they totally change the look of your room. I had chair slips made several years ago, and it gave me the look i was hoping for, a much more romantic look and feel. 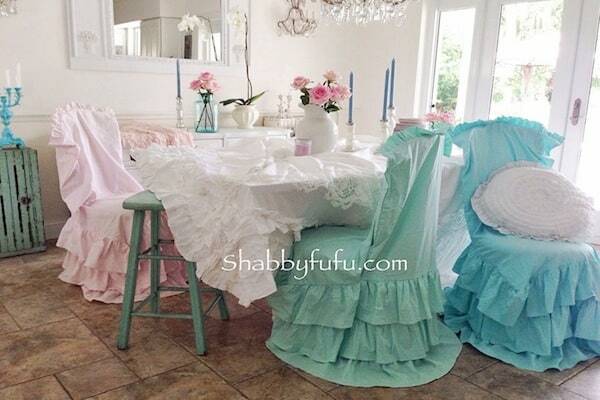 I have the fufu slip covers I ordered from you, and use them in my bedrooms now. Still LOVE them!! 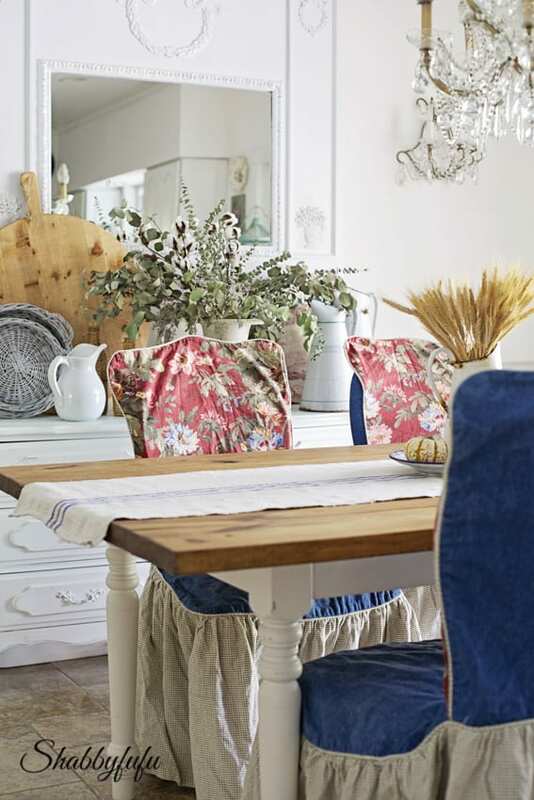 Our home was featured in a recent issue of Romantic Country, and those slip covers were in the feature…in the dining room. Always inspired by what you do, Janet! I would like to have the pink slipcover. Please let me know the price if it is still available. I love your style. I have one of your ruffled throws in white.